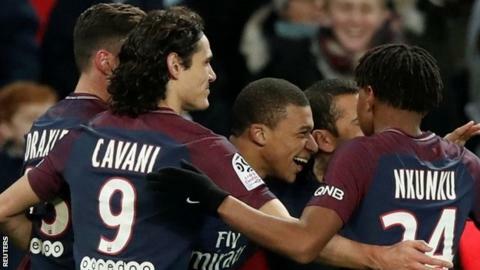 Leaders Paris St-Germain recovered from a first Ligue 1 defeat this season to beat Lille and briefly go 12 points clear. Unai Emery's side were beaten by Strasbourg last weekend, and lost to Bayern Munich in the Champions League during the week. Angel di Maria headed in Kylian Mbappe's cross and then set up Javier Pastore for a second. Anwar el Ghazi scored a late consolation, but Mbappe - who had earlier hit the post - added a third in injury time. Monaco reduced the gap back to nine points later on Saturday, coming from 2-0 down to beat Troyes 3-2 thanks to Guido Carrillo's two goals in the last five minutes. Match ends, Paris Saint Germain 3, Lille 1. Second Half ends, Paris Saint Germain 3, Lille 1. Edgar Ié (Lille) is shown the yellow card for a bad foul. Goal! Paris Saint Germain 3, Lille 1. Kylian Mbappe (Paris Saint Germain) right footed shot from the centre of the box to the centre of the goal. Assisted by Marquinhos with a headed pass following a fast break. Corner, Lille. Conceded by Marquinhos. Attempt blocked. Ezequiel Ponce (Lille) header from the centre of the box is blocked. Assisted by Kevin Malcuit with a cross. Corner, Paris Saint Germain. Conceded by Junior Alonso. Attempt blocked. Giovani Lo Celso (Paris Saint Germain) left footed shot from outside the box is blocked. Assisted by Julian Draxler. Attempt blocked. Edinson Cavani (Paris Saint Germain) left footed shot from the centre of the box is blocked. Assisted by Julian Draxler. Attempt missed. Giovani Lo Celso (Paris Saint Germain) left footed shot from outside the box is close, but misses to the right following a corner. Attempt saved. Edinson Cavani (Paris Saint Germain) left footed shot from the centre of the box is saved in the bottom left corner. Assisted by Kylian Mbappe. Yuri (Paris Saint Germain) wins a free kick in the defensive half. Foul by Yassine Benzia (Lille). Goal! Paris Saint Germain 2, Lille 1. Anwar El Ghazi (Lille) right footed shot from the centre of the box to the bottom left corner. Foul by Ezequiel Ponce (Lille). Substitution, Paris Saint Germain. Christopher Nkunku replaces Javier Pastore. Substitution, Lille. Boubakary Soumare replaces Thiago Maia. Adama Soumaoro (Lille) wins a free kick in the defensive half. Attempt missed. Junior Alonso (Lille) header from the centre of the box is too high. Assisted by Yassine Benzia with a cross following a corner. Corner, Lille. Conceded by Yuri. Offside, Paris Saint Germain. Dani Alves tries a through ball, but Kylian Mbappe is caught offside. Kevin Malcuit (Lille) wins a free kick in the defensive half. Yassine Benzia (Lille) is shown the yellow card for a bad foul. Giovani Lo Celso (Paris Saint Germain) wins a free kick in the defensive half. Attempt saved. Anwar El Ghazi (Lille) left footed shot from outside the box is saved in the centre of the goal. Assisted by Ibrahim Amadou. Substitution, Lille. Anwar El Ghazi replaces Nicolas Pepe. Dani Alves (Paris Saint Germain) is shown the yellow card for a bad foul. Edgar Ié (Lille) wins a free kick in the defensive half.